Place the corned beef, pepper, allspice, bay leaves and salt into a large 8-quart pot along with 3 quarts of water. Bring to a boil, lower heat to low and cook, covered, for 2 1/2 hours. Add carrots, onions, potatoes, celery, and cabbage. Return to a simmer and cook uncovered for 30 – 45 minutes until the vegetables are tender. Using a slotted spoon, transfer the cabbage to a large platter. Slice the corned beef across the grain of the meat into thin slices. 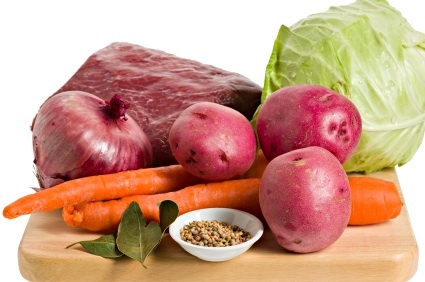 Lay the slices over the cabbage and surround it with the potatoes, carrots, and celery. Ladle some of the hot cooking liquid over the corned beef and season with pepper. Serve immediately with mustard or horseradish sauce.